Is competing at the Olympic Games in your late thirties even possible? Don’t ask kayak athlete Maggie Hogan that question! 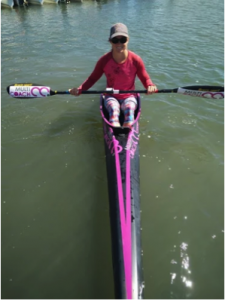 Like fine wine, Maggie only gets better with age and has recently qualified the only K1 canoe sprint slot for U.S. women to compete in the 2016 Rio Olympic Games. Maggie Hogan has been a participant in the Athlete Career and Education Program for over four years now, working as an Adecco associate and member of the Train Wreck Repair team with GE Transportation. This virtual and flexible job has allowed Maggie to work part-time while training and competing full-time in her sport and allowing her to reach this new plateau. Tell us a little bit about the k1 500 discipline that you will be contesting in the next few days? Canoe Sprint is a kayaker’s drag race. Even though our sport is called “Canoe”Sprint the sport consists of kayaks and high kneel canoes. I race the “K1” 500 which means “kayak” “one person.” In our sport we also race double kayaks (K2) and four person boats (K4). We race 500 meters in a straight line, first to cross the finish wins, pretty simple. Our boats are designed for speed and are extremely hard to balance. It takes years to develop the power, strength and technique on such an unstable surface. Racing the 500 is like racing an 800 meter run on a balance beam. Our sport has a very difficult Olympic qualification process. Only 14, K1 500 Olympic quota spots are available to the women of planet Earth. Eight of those spots are awarded at the previous year’s World Championships. The remaining six spots have to be won at five regional qualifiers which include Europe, Asia, Oceania, Africa and Pan America. Europe has two K1 spots and the rest of the region’s only have one. When the Pan American regional qualifier started, all the other qualifiers had finished, so I was racing for the very last K1 500 spot available! You came to canoe sprint later in life, at 26, when most athletes would be looking to wrap up their elite career. What were the positives and negatives of competing as an older athlete? The positives were that I finished my undergraduate studies, had work experience as well as a successful collegiate swimming career and had been a National Team athlete in Surf Lifesaving. Training and competing at a high level while working and balancing a “real” life was something I was already comfortable with. The negatives were that I was very far behind the competition when it came to technique. My days as a swimmer served me well in the cardiovascular element of my sport, but I really had to work hard on the strength, power and technical elements. US canoe sprint and kayakers receive very little funding for their sport. Why is it so vital to an athlete’s success to have employment and the ability to earn a paycheck while competing in their sport? I chose a sport that has zero funding, so I’ve had to pay for quite a bit out of pocket to compete and train. Even at the Olympic Games, I will have to pay to use equipment and any incidentals that come my way. I heard a statistic recently that 80% of Olympians live under the poverty line. Many of us are in fringe sports and have had to fund the entire process in creative ways. These folks are hardworking, goal oriented people who have a very unique daily schedule and travel requirements which make traditional employment difficult. My coach Michele and I are very lucky to have Motionize as sponsor that has allowed us to pay rent this year; they are literally keeping us afloat. You have been in the ACE program for four years now. How has it helped you to successfully qualify for Rio? I worked as an associate scientist in cancer research for many years when our sport was based at the Chula Vista Olympic Training Center. When we had to move out of the training center, finding a job became very difficult. It’s hard to find a job when you’re only in a place for a few months at a time. I had gone through so many jobs trying to make ends meet, but nothing was consistent. I remember when I first reached out to the Athlete Career and Education program, my substitute teaching position was going through a crisis with teacher layoffs in California and I could not find work. Through the ACE program I was able to secure a remote position at GE and it was the best news ever! Having a steady income takes a lot of stress off my shoulders. The best part is that I take this job on the road and can work from anywhere in the world. Tell us about your job with Adecco working for GE Transportation? What have you learned through working at GE Transportation? I think communication is the most important part of my job. 90% of the people I work with, I haven’t met in person. Everyone communicates differently, so respecting and understanding that is key to get my job done in a timely fashion. What advice would you give to other athletes that receive little to no funding to participate in their sport and struggling to continue? Obstacles are put in our path to show us how much we want to achieve something. If there is a brick wall in your way, find a way around it, through it, over it, or knock it down. Don’t take “no” for an answer; if you really want something you will find a way to make it happen. Get creative, stay positive and use your resources! What benefits do you think athletes receive by participating in the ACE program? I think there is a danger of focusing too much on your sport and becoming one dimensional, something I’ve done in my career and have thankfully changed. The ACE program allows athletes to grow and network with great businesses while competing at the highest level. It can be daunting to think of earning money after sport because we have to focus so much to be successful. The ACE program has helped me prepare for this next step. What are your career plans for life after sport? My coach, Michele has a business in South Africa called MultiCoach, which provides elite level coaching and programs to different paddle sports in an online format. I am her first athlete in the new US chapter of MultiCoach, and it has been a great success so far! I am going to join her as a partner when Rio is done. We will be bringing in coaching education, creating training programs for clubs and running clinics around the country. In kayaking, there are many forms of racing that are World Championship level, but not Olympic level. Michele and I have been active in the Surfski, Marathon, Surf Lifesaving, Dragon Boat and SUP (stand up paddle) communities for a very long time. Together we have been to 34 World Championships in 5 different paddle sports, and 5 Olympic Games (in an array of positions). She coached me to the first medal by a US athlete in over 20 years in Canoe Sprint! We are so excited to share our knowledge with our community, worldwide. How can fans follow you both in Rio? 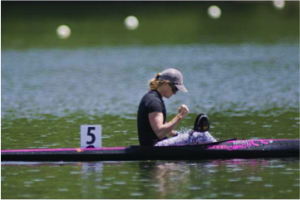 Tell us about your canoe sprint coach and Olympian Michele Eray? Two years ago I was ready to retire from the canoe sprint; I was in a major rut and had not produced results that I was proud of. I didn’t want to retire on a bad note, I wanted to walk away knowing I left it all on the table, no regrets, head held high and decided to go for one more season. I decided to change coaches and asked Michele if she would help. Two years later, we have the only US Olympic Qualification slot and a medal from last year’s World Championships; the first by a US citizen in 20 years. She has been the positive attitude and instrument of change that I needed to succeed. From a coaching perspective, she’s pretty well rounded. She has been an Olympic Finalist for South Africa, helped Bridgett Hartley to a Bronze medal in London, served as USA Canoe Kayak’s High Performance Director, founder of MultiCoach and is now the US Olympic Team Coach. Not bad; and that’s not all…. She is a World Champion in Surfski, a World medalist in Marathon Canoe, a down river champion, and a World medalist in Surf Lifesaving. So much knowledge and skill AND she’s younger than me (by 5 months). She is ridiculous; with more energy than a 5 year old. I owe her quite a bit. She’s become a tremendous friend and mentor along the way. You have been working a long time to qualify in canoe sprint for an Olympic Games. How does it feel to have all your hard work pay off and what are you looking forward to the most in Rio? Over 10 years in the making! It feels great! I still can’t believe it’s real. Our qualifier was near Atlanta, so my family was able to come watch and I’ve been so overwhelmed by the amount of people that took notice. It was a dream come true. As far as Rio, I am looking forward to giving this last race and preparation phase all I have. What an honor to go to an Olympics; I am going to enjoy every moment and represent my country, team, family and supporters to the best of my ability. Last one, fast one! Thank you so much for your time Maggie. Canoe Sprint action gets underway in Rio on August 17th! In our next blog we will talk to Maggie Hogan’s coach Michele Eray to get a different perspective on the benefits athletes can receive in the ACE program. Maggie, we wish you the best of luck and we will all be cheering for you in Rio! Go Team USA!